The opaque, waterbased ink in Uni Posca markers dries to a matte finish on both porous and non-porous surfaces. Odorless, fadeproof, and bleedproof. 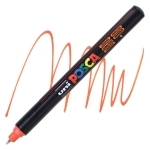 ™ Uni-Posca is a trademark.